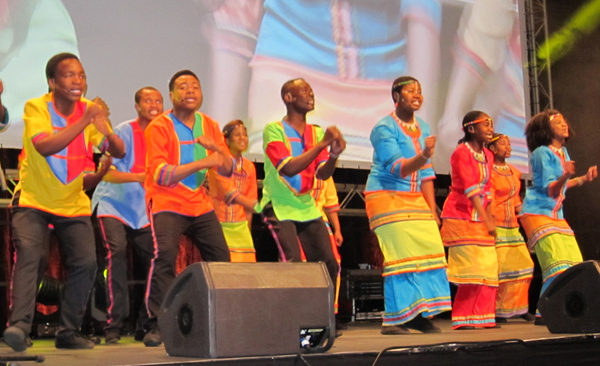 The Mzansi Youth Choir of Soweto performs at the opening session of the 81st International Federation of Library Associations and Institutions’ World Library and Information Congress in Cape Town, South Africa, August 16, 2015. 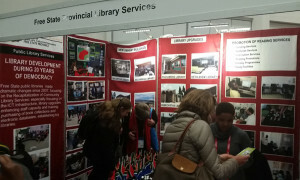 Storytelling, dancing, and rousing songs by the Mzansi Youth Choir of Soweto set the stage for the 81st International Federation of Library Associations and Institutions’ (IFLA) World Library and Information Congress (WLIC) in Cape Town, South Africa, August 15‒21. A total of 3,190 library delegates from 112 countries were present for this year’s event, themed “Dynamic Libraries: Access, Development, Transformation.” This is only the third time that IFLA has had an African venue for its WLIC—Durban, South Africa, in 2007 and Nairobi, Kenya, in 1984 were the earlier locations. 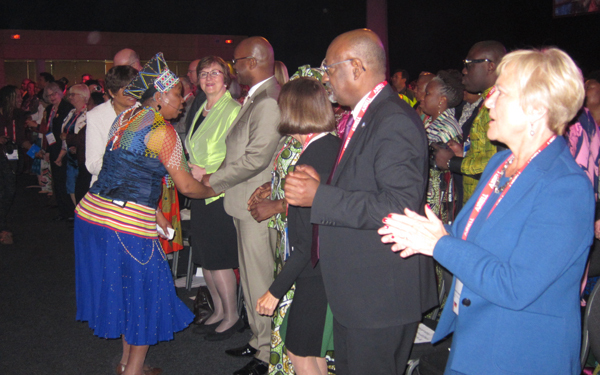 Storyteller Gcina Mhlophe (left) dances with delegates. The Mzansi Youth Choir, a troupe of young men and women ages 12‒24 who have sung and danced at music festivals worldwide, followed with a rendition of the late South African singer Miriam Makeba’s 1967 hit “Pata Pata,” accompanied by some dazzling choreography that had delegates rising from their seats and swaying with the rhythm. Require the African ministers responsible for arts and culture, libraries, and access to information to meet regularly. The signatories to the declaration were the countries of Angola, Burkina Faso, Cape Verde, Côte d’Ivoire, Lesotho, Guinea, Madagascar, Malawi, Mozambique, Nigeria, South Africa, South Sudan, and Swaziland. Another way that the global information society is being created is through the acquisition, storage, and analysis of Big Data, especially in the physical sciences. 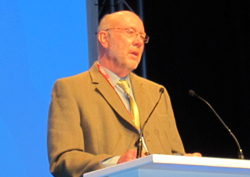 Opening session keynote speaker Rob Adam gave delegates an update on what he calls “one of the greatest scientific endeavors in history”—the Square Kilometer Array (SKA) project being constructed in the deserts of South Africa and Western Australia. SKA will become the “world’s largest radiotelescope,” Adam said, and will “involve the world’s finest scientists, engineers, and policymakers” from at least 10 countries in its design over the next 10 years. Adam is a South African nuclear physicist who, after being imprisoned in Pretoria for 10 years as an anti-Apartheid activist and member of the African National Congress, went on to become a leader in scientific development for the new democratic government. 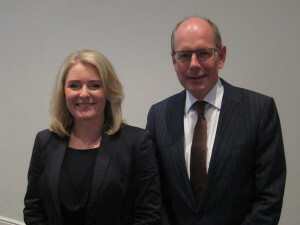 He lobbied vigorously to have his country be a primary partner in the SKA project, and at the end of 2015 he will become SKA’s South African director through 2020. The SKA will involve a connected series of radiotelescopes with a combined surface area of one square kilometer, hence its name. It will have the imaging resolution of the Hubble telescope, require high-performance computers faster than any in existence in 2015, and “generate data traffic at a comparable level to the current global internet,” Adam said. All this will require a Big Data storage and retrieval plan that is currently under development. Adam said that current radiotelescopes can detect planets orbiting other stars, but Phase One of SKA will be able to “detect radar signals from those planets” and Phase Two (scheduled for 2025) will be able to “detect television broadcasts from those planets” (should any exist). 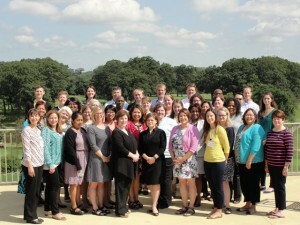 Storytelling and data sharing were also featured in OCLC’s Industry Symposium, held on Monday, August 16. Erik van Lubeek, vice president and managing director of OCLC’s Europe, Middle East, and Africa region (EMEA), explained that OCLC has a long history of working with libraries to build national bibliographies, but that today’s vision extends beyond national borders. 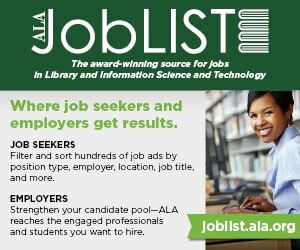 “Library networks see the value of working globally,” he said, “because their users are asking for it” and benefiting by it. This is the basic concept behind OCLC’s new branding effort for its WorldShare platform, the web architecture that provides access to its WorldCat data. Introduced in July, the trademarked catchphrase is that knowledge knows no bounds “because what is known must be shared.” OCLC Director of Sales and Marketing for EMEA Dénelise L’Ecluse explained that advances in technology “changes how libraries and OCLC collaborate.” The new goal is to “bring libraries together to share the world’s collective knowledge,” and this session explored several stories about how this sharing has led to breakthroughs in people’s lives. Perhaps the most poignant was provided by Ebinumoliseh Ifeoma, a postgraduate student in chemistry at the University of KwaZulu-Natal (UKZN) in South Africa, who fought for many years for her right to an education. 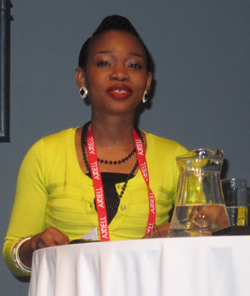 A Nigerian national, Ifeoma had to apply to a South African university to obtain a bachelor’s degree because universities in Nigeria “have outdated books, no internet access, and few of the right chemicals and equipment” she needed. “The South African government,” on the other hand, “makes it easy to study,” she added. One major factor in her quest to earn a postgraduate degree was UKZN’s vision to become a first-class institution of African scholarship. 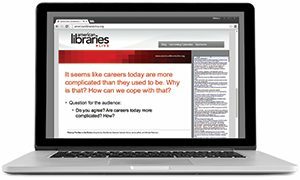 In order to do this, the university asked OCLC and Sabinet, a South African provider of online documents and journals, to get the library up to speed with scientific publications on the WorldShare platform. Sabinet Managing Director Rosalind Hattingh told the group that WorldShare data migration and staff training was implemented in a record four months, allowing the platform to go live on January 6. GEORGE EBERHART is the senior editor of American Libraries.